In 2008, WSSC began using electricity generated by a wind farm in southwestern Pennsylvania equally approximately 65,000 megawatt (MW) hours of power per year. Fourteen turbines generated this electricity, each producing 2.1 MW. We are also a Green Power Partner of the US EPA. Today, WSSC purchases renewable energy credits with the Montgomery County Aggregate Buying Group for 100% of its electrical energy. In 2019, WSSC plans to award a new long-term wind contract at rates less than conventional power rates. 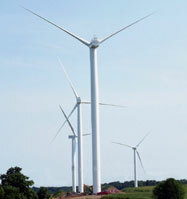 Wind power accounts for 28 percent of WSSC’s total electric consumption. In addition, WSSC incurs no capital cost as part of its wind procurement. WSSC is committed to protecting the environment for generations to come. The use of wind power contributes to the reduction of greenhouse gases released into the Washington area by 38,000 tons per year. This is the equivalent of taking 100,000 cars off the Capital Beltway.